The Triangulator is a practice aid that helps train your eye as to what correct aim looks like as you stand over a putt. To effectiively use the Triangulator, please follow these simple steps. 1. Line up a 10'-15' putt as your normally would and then address the ball as if you were about to make a putt. 2. Without moving your putter (so you do not change where your putter is aimed), remove the ball and replace it with the Triangulator so that the white line on the Triangulator is aligned with the center of your putter face and extends towards your target. 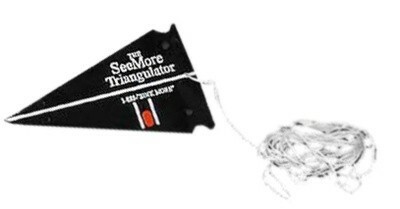 You can use golf tees to hold the Triangulator in place or have a friend gold it in place for you. At this point, the Triangulator basically serves as a "pointer" for your putter face. 3. Extend the string over the face of the Triangulator so that it is in perfect alignment with the white line. 4. Stretch the string forward and see where you are truly aimed. Make any necessary corrections to your aim and practice putting along that line. It may assist you to place tees in the ground, draw a chalk line or place a piece of tape on the putting surface as a reference point for your correct aim.